MIDTOWN — Aggressive ticket-sellers hawking an Empire State Building ride have grown more brazen since a court order halted a police crackdown, residents and office workers complain. Many in the community say they’ve had to avoid Fifth Avenue between 33rd and 34th streets whenever possible to steer clear of the vendors, who are free to continue haggling passerby pending a July 7 court date, a judge ruled. "You can't avoid them," said Jennifer Parziale, 38, who works on West 33rd Street. She said she and other passersby are constantly harassed by the vendors, who swarm groups of tourists, trying to convince them to take the ride. The ESB Area Residents Association, a coalition of community members, recently sent a letter to Skyride complaining that since the judge's restraining order went into effect, the hawkers "have returned with a renewed determination, verbally assaulting passersby, blocking sidewalks and proclaiming they can do no wrong and there is nothing NYPD can do about them." The members also threatened to file individual counter-lawsuits against NY Skyride employees. The fight is the latest confrontation between the operators of the NY Skyride, a virtual flight simulator that operates inside the Empire State Building, and the Malkin family, who own the building. Hostilities escalated earlier this month, when Skyride sued the city for clamping down on its ticket-hawkers with a ticket blitz, which the company slammed as an "unconscionable campaign of the City of New York to destroy" the business. Skyride owners blame the Malkins for inciting the ticket blitz, charging they "have manipulated City officials like a marionette into targeting Skyline and harassing it into a showdown" in an effort to pressure the Skyride into leaving the building. Representatives for the Malkins did not respond to numerous requests for comments. Police arrested six ticket agents and issued 14 summonses over the course of eight weeks for vending without the proper license, according to court papers filed by Skyride’s operators. Supreme Court Justice Donna Mills issued a temporary restraining order against the NYPD on June 14, halting arrests and ticketing pending a July 7 court date. Melanie Sadok, Senior Counsel with the city's Law Department said, "We believe that this lawsuit lacks merit. The NYPD took appropriate enforcement action against unlicensed vendors who sell tickets on congested City streets. Those who employ these vendors were warned in advance about the planned enforcement action." Locals who regularly pass the blocks around the building say they hope police are allowed to return to ticketing the ticket sellers soon, since they are now operating with impunity. "They’re blocking my freaking lobby all the time!” said Herald Towers building manager Yehezkel Mizrahi, who said that dealing with the vendors is a constant war. Mizrahi complained of as many as "50 guys" stand in front of his building, earning complaints from his commercial tenants, including the Gap. "They're a nuisance. When you're walking by, they'll just stop right in front of you," added Catherine Yang, 34, who works across the street from the building, and said she's especially annoyed by the vendors' constant yells of "Going up? Going up?" "Do I look like a tourist?" she added. Ken Bicknell, 62, who has lived in the neighborhood for 18 years, complained to police about the vendors at a Community Precinct Council meeting in May and at a follow-up meeting this month. He submitted a log documenting as many as 48 street vendors on Fifth and Sixth Avenue between 32nd and 35th streets at a time, most of whom he said were Skyride vendors. "These guys are professional thugs," Bicknell said. Bicknell said that while the vendors had almost disappeared in the days following the arrests, they’ve returned in force and are "more arrogant" than ever following the restraining order. A spokesman for the company said Skyline had never received a single local community complaint until this week. 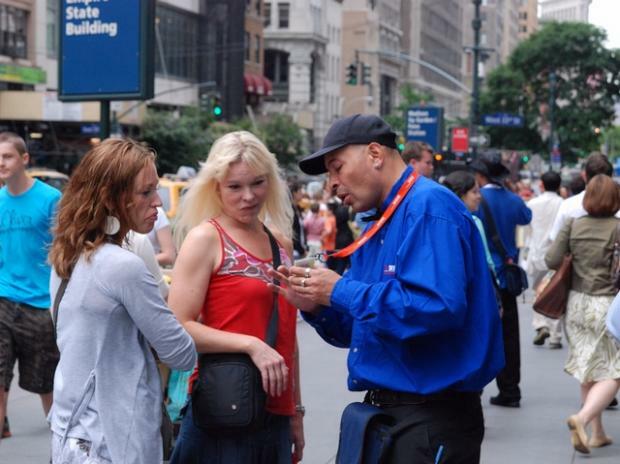 On several occasions last week, DNAinfo watched several dozen men and women in blue and orange shirts with Skyride logos on them roam the sidewalks around the Empire State building, hawking their tickets to tourists — and anyone else walking by. "Empire State, are you going up?" they repeat again and again. "Going up." One employee, who, like others, declined to give his name because of ongoing litigation, dismissed claims of harassment. "It’s clear that nobody’s getting pressured," he said. Other passerby were sympathetic to the sellers, arguing they're just trying to do their jobs. "It’s an inconvenience, but they just have to make a living," said one woman who’s worked in the Empire State Building for a decade, but declined to giver her name for fear of compromising her job. "This is what you get when you work for a tourist site," she said. Even the tourists said the pressure tactics were a turnoff. "It's such a degrading thing and it takes away from the experience. We have to be hassled to see a monument?" said Barry Calero, 45, visiting from Louisville, Kent., who said he and his family were accosted by a Skyride agent as they stepped out of a cab last week on their way up the tower. ""It's ridiculous! We're very disappointed. Get rid of them," he said. Scottie Sharp, 41, who was visiting with friends from San Francisco, called the vendors "kind of irritating." He skipped the Skyride, but left the building wearing company logo stickers that hawkers had stuck on his shirt. Rebecca Fothergill, 24, visiting from England, said "they kind of pounce on you," and said hawkers promised her that Skyride ticket-holders could bypass lines that didn’t really exist. "I think they were trying to scam us a little bit," she said.